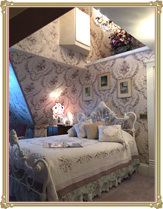 If you want to enjoy hiking or biking in the Stevens Point and Plover area when you vacation yet return at night to luxurious accomodations, then stay at Dreams of Yesteryear . Stevens Point boasts the Green Circle Trail, a 27-mile network of trails circling the city, through a system of parks, a nature reserve at UWSP, and even on right-of-ways granted by private land-owners, keeping the trail unbroken. rules for the trail are available at the B&B. 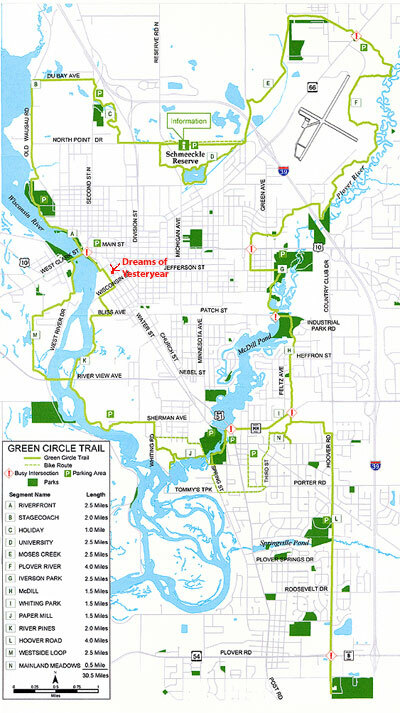 There is no charge to use the Green Circle Trail. There are even more trails nearby. If you are looking for mountain biking, check out Standing Rocks Park. Known in the wintertime for skiing, Standing Rocks has a great system of trails (10 miles worth) for mountain bikers. Just 25 miles north of Stevens Point is Rib Mountain State Park, where 13.6 miles of hiking trails await hikers interested in the beauty of a billion-year-old geographical formation. The Ice Age Trail offers hiking, backpacking, and provides a habitat for wildlife, linking Wisconsin history and culture.